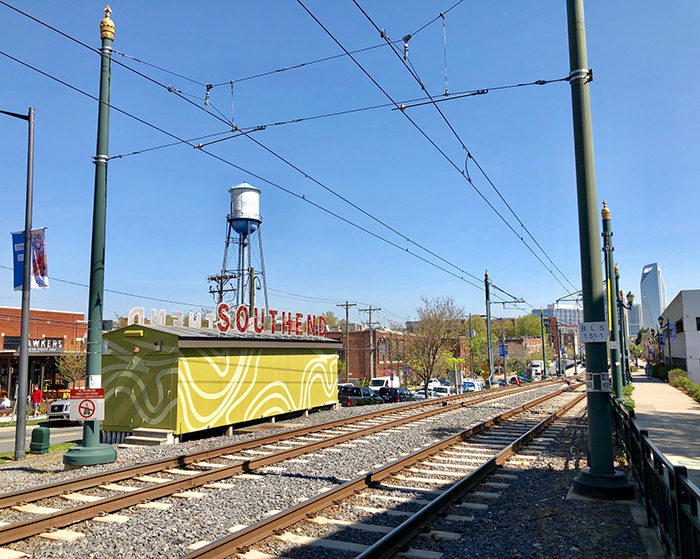 As Charlotte’s Blue Line embarks on its second decade, the light rail line has firmly established itself as one of the city’s biggest civic successes. The first train left the station in November 2007, pulling riders from Uptown south through Charlotte’s most overlooked and downtrodden areas. Today, the landscape is completely different. Instead of auto shops and empty warehouses, the Blue Line bustles past luxury apartment buildings, trendy breweries and now, gleaming office towers. Charlotte’s light rail line is still relatively small on the national scene. It’s just the 18th-largest based on weekday ridership, according to the American Public Transportation Association. But it’s also among the nation’s fastest-growing. In the first quarter, Charlotte’s Blue Line was one of just two light rail systems to show double-digit growth in ridership from the previous year, behind only Seattle. 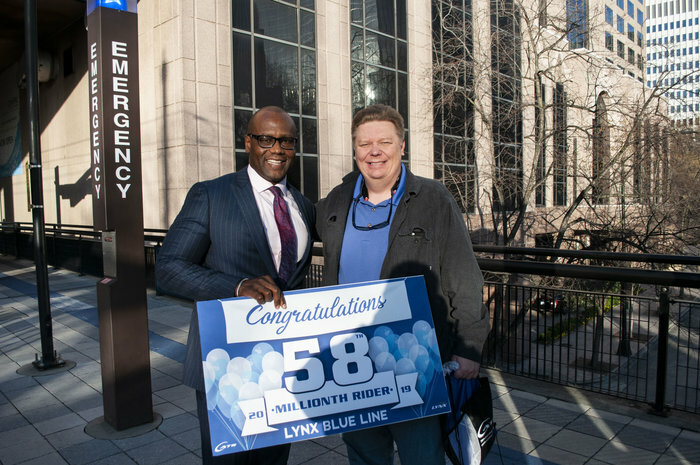 Last month, it marked another major milestone: One year since the Blue Line Extension opened to UNC Charlotte, and the light rail line’s 58 millionth rider. Charlottean Mark Helotie was estimated to be the lucky 58 millionth rider. He’s on the right, posing with CATS CEO John Lewis. Today, CATS is pushing forward on a $6 billion-plus plan to expand light rail to the east and west of the city. As Charlotte struggles to complete its streetcar, the city is hanging its hat on the success of the Blue Line to drive forward those future plans. For a project continually dogged by doubts, the Blue Line proved an almost immediate success. In its first year, CATS expected the Blue Line to average about 9,100 weekday trips. Ridership numbers came in about 50% higher than that, and by 2015, that number was up to more than 15,000 weekday trips. 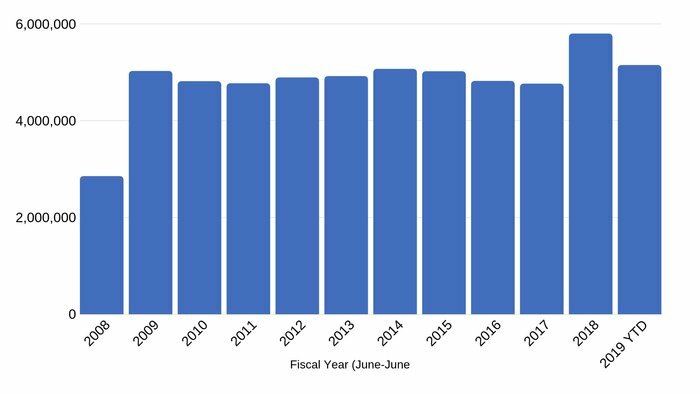 Today, average weekday ridership is around 27,500 — and CATS projects more than 7 million total riders by the end of the current fiscal year, a new record. In that regard, the Blue Line has succeeded as a people-mover, something that few other transit projects in Charlotte can claim. The track has its own right-of-way, meaning it doesn’t have to sit in traffic. And now that the Blue Line Extension is open, the light rail offers a nearly 19-mile path from UNC Charlotte southwest across the city to near the South Carolina line. In a car at rush hour, that trip could take nearly two hours. On the train, it’s less than half that. However, projections for ridership on the Blue Line Extension have lagged behind expectations. CATS expected about 33,500 daily riders once the extension opened, and that hasn’t materialized. The timing of the Blue Line Extension’s opening didn’t help. CATS expected the line to open at the start of UNC Charlotte’s school year, and trains didn’t start rolling until March. That meant that popular ridership months didn’t get included in first-year results. The Blue Line has had an even bigger impact on development. While ridership growth has mostly been impressive, the impact on Charlotte development has been much greater. The original line to the south has fundamentally transformed the areas it passes through — and similar growth is already starting along the Blue Line Extension. 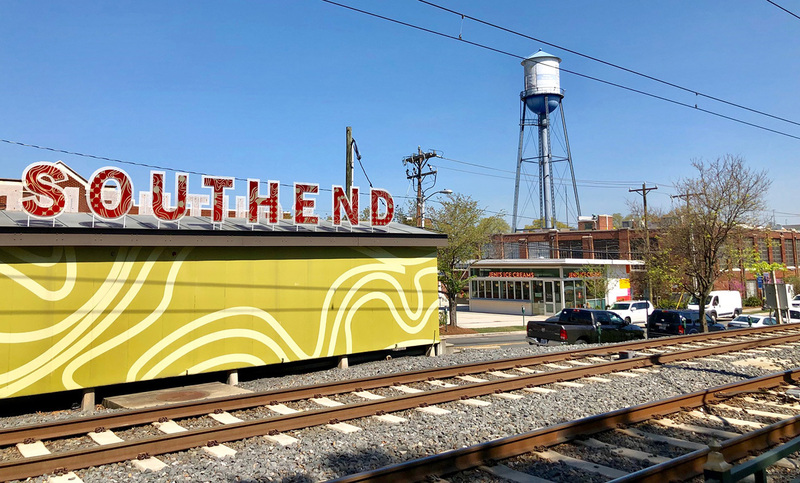 “South End underwent a Cinderella transformation, from a seedy vaguely dangerous wasteland to a thriving hub of commerce, nightlife and luxury apartments,” Charlotte Talks host Mike Collins said on a show marking the 10-year anniversary of the Blue Line in 2017. That’s not really hyperbole. 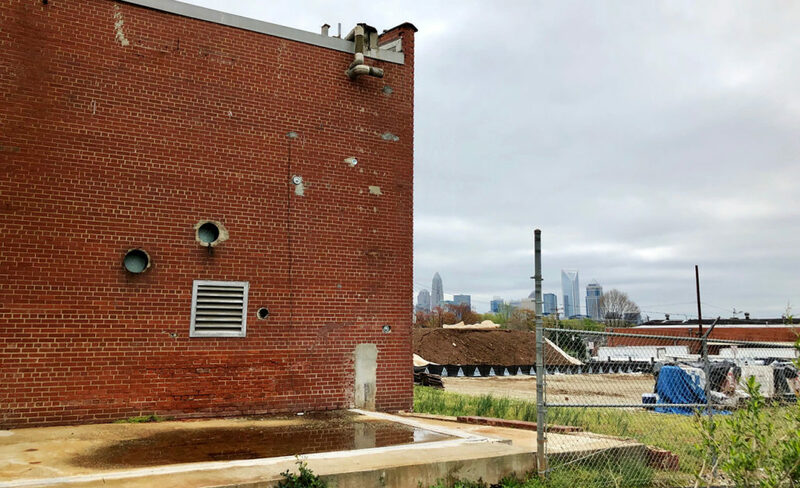 For decades, South End was primarily known for factories, auto shops and dry cleaners, industrial businesses that seeped chemicals into the soil. By the 1990s, the area was largely considered blighted and overrun with abandoned warehouses. The light rail changed all that — and quickly. The original Blue Line opened from Uptown through South End to I-485 in November 2007, at a cost of about $463 million. By 2010, roughly half a billion dollars of new construction along the light rail line had already been completed, with another $1.5 billion in the works, according to data presented to the National Governors Association. Today, the original Blue Line has now hit $2.7 billion in planned or completed development, CATS says. Charlotte leaders are hoping for the benefits to only compound as time passes. For the first eight to 10 years after opening, companies considering Charlotte for relocation weren’t looking at the light rail, former Charlotte Chamber CEO Bob Morgan told Charlotte Talks. But now, companies want to be right on the light rail line. 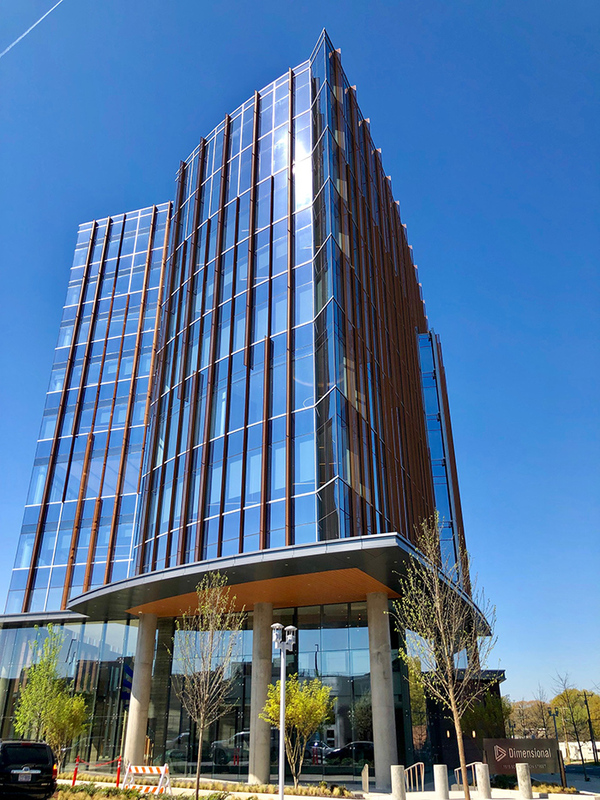 Dimensional Fund Advisors has nearly finished an eight-story office building in the heart of South End, just steps from the light rail line. More recently, Wells Fargo has leased an entire building on Brevard Street with direct rail access. That could presumably beef up development numbers. 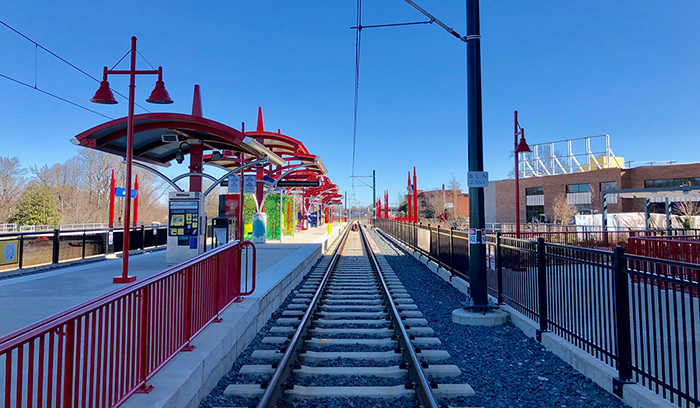 As of March 2019, the city of Charlotte has recorded about $800 million in planned, under construction or completed development along the $1.1 billion Blue Line Extension. By the year 2035, CATS is projecting a total of $44 billion in economic impact across the whole line. This economic growth could also help Charlotte build more light rail. CATS CEO John Lewis has led the planning on a 25-mile “Silver Line” route that would run from Matthews, through Uptown, past Charlotte Douglas International Airport and across the Catawba River into Gaston County. The current line was built primarily using a half-cent sales tax dedicated to transit. That won’t suffice for new rail lines. CATS is now looking at funding mechanisms that use the expected future benefit of a project to borrow money to fund it. None of that would be possible if the Blue Line wasn’t a success to begin with.